Registered trainer in group outdoor exercise with nutrition. I have always loved food this passion for eating has not abated over the years. It was probably not very helpful when I was younger as I trained at drama school to be an actress so was forever on some kind of new ‘diet’ to make sure I was at the right weight for my burgeoning film career! I later became an interior designer. Throughout, I have retained a passion for exercise, starting at ballet school, with a natural desire for keeping fit and supple. Raising a family, a 21 year old girl and a 10 year old boy, helped me develop an interest in nutrition and healthy eating. 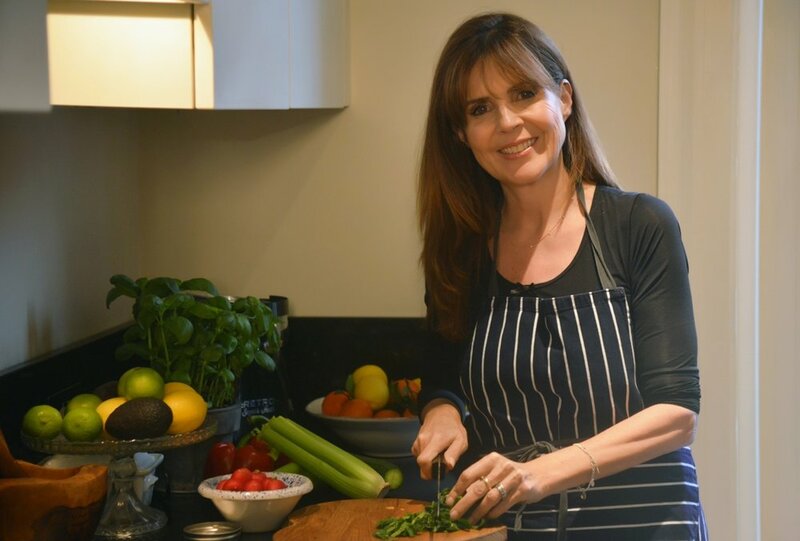 Having said that I really started my food journey when I became unexpectedly and unexplainably ill in my 40’s. My site in one eye was at stake so I searched in all areas to help myself get better through visualisation and focusing nutritionally how I could support my body to get better. This empowered me so much when I saw how my health issues cured, my site came back, my energy levels increased, my hormones became balanced as did my mood. I wanted a complete career change three years ago so trained with Premier Global to become a qualified group fitness trainer. I had a vision of working with small groups of people working out in the park then coming back to my flat for delicious food. I haven’t completed the last part yet but started helping my clients to get to their ideal weight through a lifestyle change that I have devised rather than through a restrictive diet. My real journey started five years ago when I was a stone over weight and had given up ever being able to shift it. Whether I ate healthily on a diet off a diet nothing would budge this stone. I decided that it must be this ‘middle age’ spread I had heard about. I then read a review about a book called ‘Future Proof Your Skin’ by Stephanie Williams which promised advise on how to improve your skin through diet amongst other factors. I bought the book not thinking any more than it may give me some tips for my skin……well I could not put this book down it had a hypnotic effect on me to the extent when I finished it I finally felt as though the missing link to what when and how I ate had been answered. I swept our food cupboard and fridge of all sugar and grain. We replaced low fat with high fat and started fasting two to three times per week. Within months my husband had lost two and a half stone I had lost the stubborn stone and my daughter lost half a stone.This weight has never returned we are now five year into this complete lifestyle change and have never felt fitter, more energised and happier.It is so liberating not to be harnessed to a restrictive pattern of eating, having crazy food voices in your head and just feeling free to enjoy food. I got pregnant naturally at the age of 47, this was prior to our complete lifestyle change but I had started to eat a healthy diet several years before. I had no symptoms of the menopause. I am looking forward enthusiastically to the rest of my life. You will be given a concise questionnaire to complete—an outline health survey, background personal fitness report, and a lifestyle and diet survey. In depth consultation at your home, talking through the questionnaire and discussing any key issues. Key to the 12 Week Body Transformation Programme is not a diet. You will be given specific food and meal advice for the entire duration of the programme. As part of this stage, your larder, fridge and eating habits will all be audited. An essentials list will be supplied. Pre-programme briefing Following a detailed analysis of your questionnaire, a programme specially tailored to your specific needs and aspirations will be prepared. You’ll then be briefed on your programme prior to its commencement and supplied with specially designed recipes and meal plans. Unlike a diet (which never works) or a traditional weight loss programme, Rebodied is a , one-to-one ACTION PLAN tailored exclusively for an individual’s specific needs. Thanks to a unique blend of eating style, movement and mindset development — clients achieve amazing results. I have created a method to help both women and men get to their ideal size and body shape and stay there. This then helps people create an elevated sense of energy, vibrancy and well being within themselves. These results are life lasting creating a feeling of confidence, revitalization and control. My wish is to change peoples eating habits—I want to work with people to break their old bad habits and help them create new healthy ones.